We're on a mission to provide the best possible sprint burndown chart for Trello. Now weâ€™ve done a complete rewrite of our sprint features based on the feedback weâ€™ve received from you - our users. In addition to the sleek new design, there's a whole bunch of new functionality baked in. So many, in fact, that we decided to rename the screen to Sprint. 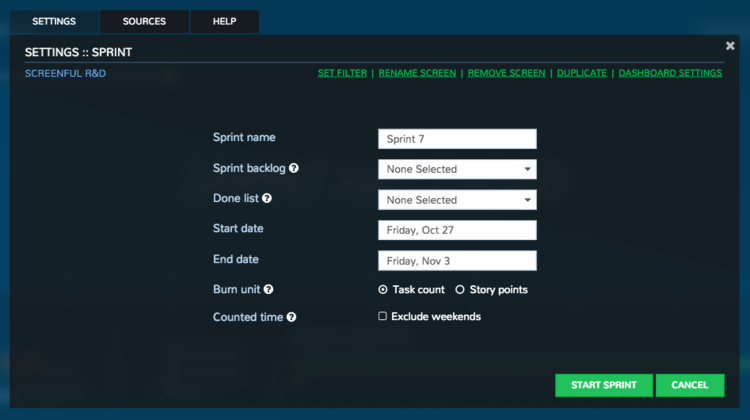 After all, it's no longer just a burndown chart but a whole set of features that can help you run your sprints successfully. Trello does not have built-in support for Scrum process. However you can use its core features to represent Scrum artifacts like product and sprint backlogs, time estimates, and time-boxed sprints. The screenshot below shows an example Scrum board in Trello. In the beginning of the sprint, all the cards scheduled for the sprint are in the sprint backlog list. During the sprint cards are moved from left to right, and if everything goes as planned, all the cards are in the Done column when the sprint ends. You don't have to limit your backlog to a single list or even a single Trello board as our new burnup chart can combine multiple lists from multiple boards into one backlog. There must be least one list to represent the work in progress. Depending on your workflow, there can be multiple in progress lists such as In Review or Waiting for deployment. A sprint is completed by clicking End sprint in the chart settings. First of all, we've done some adjustments to the design of the chart. We made the burndown part bigger, and the bottom part containing supporting information smaller. Another change you'll notice in the new UI is the quick menu on the top right corner, which allows you you switch between the views. That allowed us to pack in more functionality without adding complexity to the burndown chart itself since you can now find additional information behind that menu. As soon as you have sprints completed, they'll appear in the menu. You can choose to see the burndown of the currently running sprint, or any of the previous sprints. You can also delete any of the old sprints by clicking the settings icon and selecting Remove sprint in the chart settings. While the burndown chart gives you an overview to how your sprint is progressing, you'll likely want to dig deeper than that. What is the status per each individual? We've got you sorted. Now you can switch to Task Status view from the dropdown menu to see the status per individual. 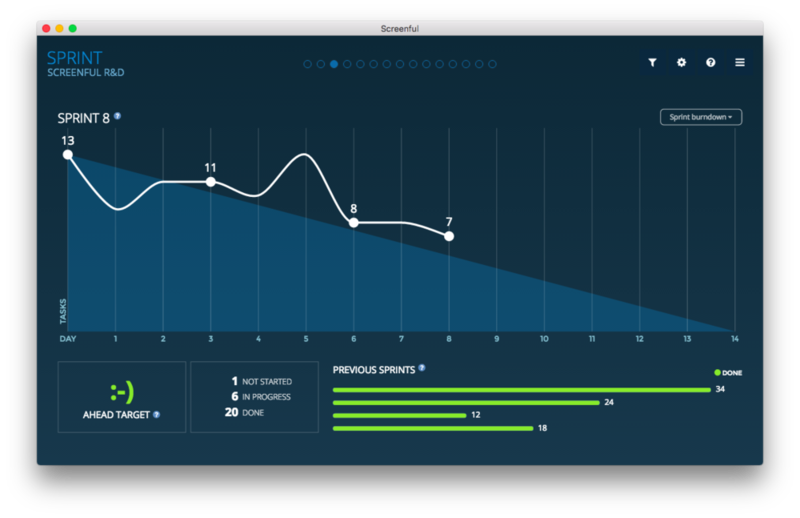 This view shows the number of tasks per individual assigned to the sprint. In the rightmost column, you'll see the number of tasks in Not started / In progress / Done state and clicking the numbers reveal the individual tasks. Great for daily stand-ups! One benefit of seeing your team's historical velocity is that you can use that for estimating how much work you can accomplish per sprint. Selecting Planned vs done from the menu shows how close your planned work is to completed work per sprint. 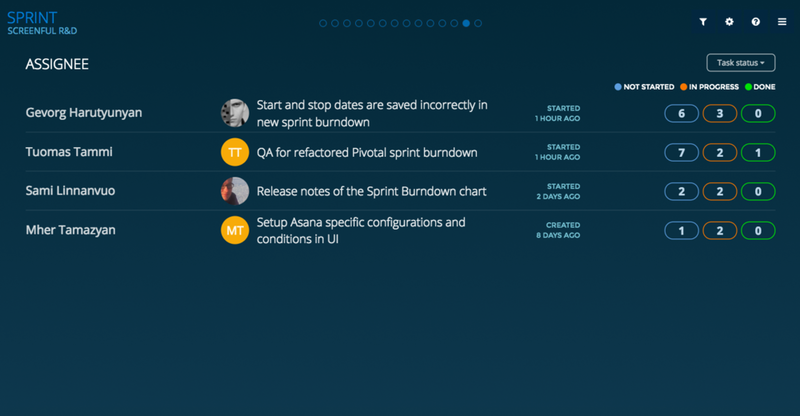 If tasks are added or removed during the sprint, those are shown as small circles in the timeline. You can hover your mouse over the circle to see which task was added or removed. You can choose whether weekends are counted as working time. If you select Exclude weekends in the chart settings, the expected burndown is flat during the weekends. You can have your backlog scattered into multiple lists, or even multiple Trello boards. This is useful e.g. in a case that you have a one board for backlog and another for sprint tracking, or in a case that you have multiple teams working on their own boards but still participating in the same sprint. We're pretty sure that this is the best burndown chart you can get for Trello so why not give it a try by signing up for the free 21 day trial. Got questions or feedback? Let us know at the comments or email at hello@screenful.com. To stay on the loop, read our blog, or follow us on twitter or Facebook.